Raimondo Van Riel (1881 - 1962) was an Italian stage and film actor and mask maker of Dutch descent. 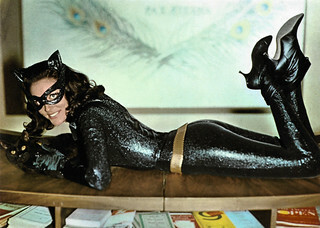 His specialism was bad guys and evil villains. Italian postcard by Ed. A. Traldi, Milano, no. 670. Photo: UCI (Unione Cinematografica Italiana). 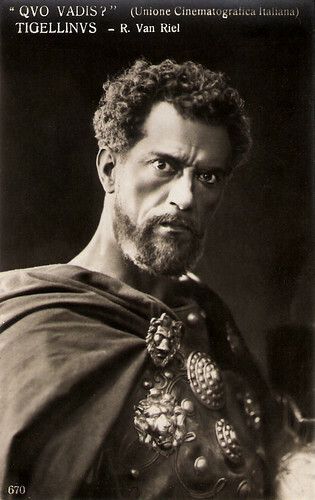 Publicity still of Raimondo Van Riel as Tigellinus in Quo vadis? (1925). Raimondo Van Riel was born in Rome, Italy in 1881. He started to act on Roman local stages, becoming well-known as the villain. Together with his wife, actress Aidé Bongini, who was part of the company of Alfredo Sainati, he acted on stage between 1909 and 1919. 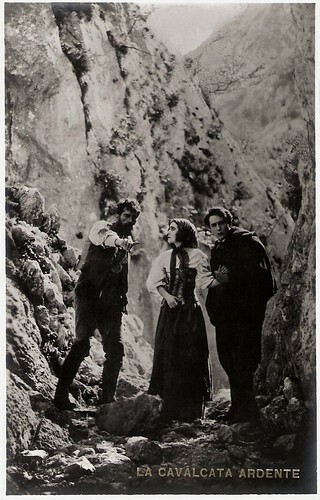 In 1914 Van Riel made his film debut in the silent short film Per un’ora d’amore/For an hour of love (1914, Luigi Maggi), starring Bella Starace Sainati and her husband Alfredo Sainati. Five years later, he began a steady career in the Italian silent cinema. This period started with the Berta Nelson vehicle Fiamma simbolica/Symbolic Flame (1919, Eugenio Perego), a drama of vengeance which was found and restored in recent years at the Eye Institute (formerly Dutch Filmmuseum). In 1919 Van Riel was offered a film contract by film producer and director Enrico Guazzoni. In subsequent years, Guazzoni often employed him as the ‘bad guy’ as in Il Sacco di Roma/The Sack of Rome (1920, Enrico Guazzoni, Giulio Aristide Sartorio), La congrega dei ventiquattro/The congregation of twenty-four (1921, Enrico Guazzoni) and Le tre ombre/The three shadows (1921, Enrico Guazzoni). In the early 1920's, Van Riel also played in dramas directed by Mario Bonnard for Bonnard Film, starring Vittoria Lepanto and Dolly Morgan, and directed by Carmine Gallone for Caesar Film, starring Yvonne Fleuriel. Other films were Un viaggio nell’impossibile/A journey into the impossible (1923, Nunzio Malasomma, Luciano Doria) with strong man Giovanni Raicevich, and Il cammino delle stelle/The path of the stars (1924, Guglielmo Zorzi) with Linda Pini. Italian postcard by Ed. A. Traldi, Milano, no. 668. Photo: Unione Cinematografica Italiano. 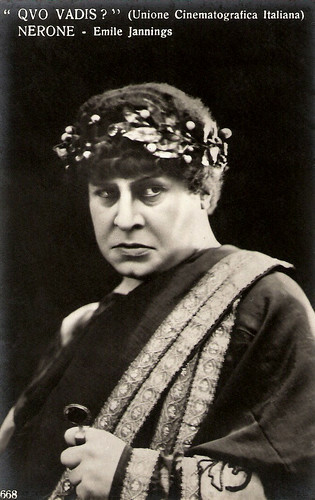 Publicity still of Emil Jannings as Nero in Quo Vadis? (1925). On the back an ink stamp for the Politeama Cesare Rossi, Fano. 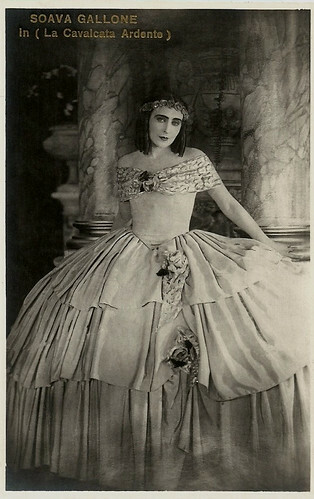 During the mid-1920's, Raimondo Van Riel played in three major productions. First of all he played emperor Nero’s (Emil Jannings) evil general Tigellinus in the silent costume epic Quo vadis? (1925, Georg Jacoby, Gabriellino D’Annunzio). 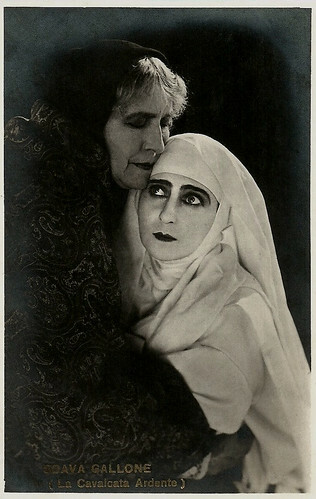 Then Van Riel played the devil in La giovinezza del diavolo/The youth of the Devil (1925, Roberto Roberti), starring Francesca Bertini as a female Faust. 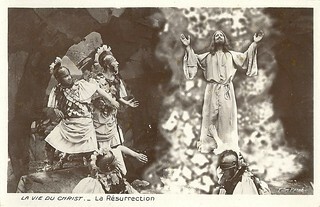 This was a kind of remake of Rapsodia satanica/Satanic Rhapsody (1914-1917, Nino Oxilia), the major production of Bertini’s former rival Lyda Borelli. And then there was La cavalcata ardente/The fiery ride (1925, Carmine Gallone), in which Van Riel played Pasquale Noto, a bandit during the Italian Risorgimento. For a change he is the good guy in this film. He helps out the patriot Giovanni (Gabriel de Gravone) to get the girl of his dreams, the aristocratic Grazia (Soava Gallone), although she is promised to an evil prince (Emilio Ghione). Then followed roles in Risa e lacrime napoletane/Neapolitan laughter and tears (1926, Gian Orlando Vassallo) with Lia Maris, the historical film Beatrice Cenci (1926, Baldassarre Negroni) with strong man Celio Bucchi and Maria Jacobini, and two more films by Vassallo: El moroso de la nona/And arrears of the ninth (1927, Gian Orlando Vassallo) and I rifiuti del Tevere/The waste of the Tiber (1927, Gian Orlando Vassallo). Italian postcard by G.B. Falci, Milano. Photo: Raimondo Van Riel and Gabriel de Gravone in the historical film La cavalcata ardente/The fiery ride (1925). In the mean time Raimondo Van Riel had started working in Berlin as well. For four years (1926-1930) he worked in the German cinema. He had major parts in action films and thrillers. As the adversary of Harry Piel he played in Zigano (1925, Gerard Bourgeois, Harry Piel), and Achtung! Auto-Diebe!/Attention! Car thieves! (1930, Harry Piel). He also starred opposite Italian action star Carlo Aldini in Der Kampf gegen Berlin/The struggle against Berlin (1926, Max Reichmann), the Czechoslovakian production Dva pekelné dny/Two days of hell (1928, William Karfiol), and Im Kampf mit der Unterwelt/In the battle with the underworld (1930, Carlo Aldini). He also co-starred with the other Italian strongman of the German silent cinema, Luciano Albertini, in Menschenleben in Gefahr/Human lives in danger (1926, Karl Gehrhardt), and Die Jagd nach der Million/The hunt for the Million (1930, Max Obal, Rudolf Walther-Fein). However, Van Riel also played in dramas and comedies, including Der goldene Abgrund/The Golden Abyss (1927, Mario Bonnard) with Liane Haid, Flucht aus der Hölle/Escape from Hell (1928, Georg Asagaroff) opposite Jean Murat, and Mein Herz ist eine Jazzband/My heart is a jazz band (1929, Friedrich Zelnik) starring Lya Mara. In 1930 Raimondo Van Riel had the lead in Kurs auf die Ehe/Kire lained/Wellen der Leidenschaft/Course on marriage, directed by former Russian actor Vladimir Gajdarov and co-starring Ita Rina. It was a German-Estonian production and the first in its kind. The film dealt with alcohol smuggling between Estonia and Finland, and was shot on location in Estonia while the interiors were shot in Berlin. Kurs auf die Ehe still exists. Italian postcard by G.B. Falci, Milano. Photo: Soava Gallone and Jeanne Brindeau in La cavalcata ardente/The Fiery Ride (1925). During his Berlin years, Raimondo Van Riel had come back to Italy to act in the orientalist drama Kif Tebbi (1928, Mario Camerini), but by 1931 he definitely returned to Italy and played supporting parts in Italian sound films, such as Corte d’Assise/Before the Jury (1931, Guido Brignone) starring Marcella Albani, Terra madre/Mother Earth (1931, Alessandro Blasetti) with Leda Gloria, and Figaro e la sua gran giornata/Figaro and his big day (1931, Mario Camerini). He also appeared in the historical films Lorenzino de’ Medici/The Magnificent Rogue (1936, Guido Brignone) featuring Alexander Moissi, Scipione l’Africano/Scipio Africanus: The Defeat of Hannibal (1937, Carmine Gallone) and Il ponte dei sospiri/The bridge of sighs (1940, Mario Bonnard). From 1936 on Van Riel worked as a mask maker (make-up artist) and in 1937 he became lecturer in mask making at the new film academy Centro Sperimentale di Cinematografia in Rome. After the war Van Riel played parts in films between 1948 and 1959. His last – uncredited - part was that of an old man in Wiliam Wyler’s monumental epic Ben-Hur (1959). Raimondo Van Riel died in Rome in 1962. He was 81. Italian postcard by Ed. G.B. Falci, Milano. Photo: Soava Gallone in La cavalcata ardente/The Fiery Ride (1925). 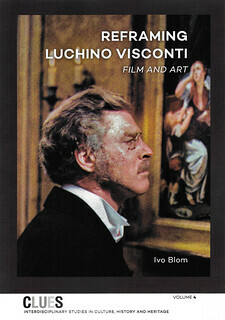 Sources: Vittorio Martinelli (Il cinema muto italiano), Wikipedia (German), and IMDb.